Those who take a lot of screenshots—for articles, for books, for instruction manuals, and the like—know that sometimes you want to capture the entire screen, but sometimes you want just a particular element on the screen. Ambrosia’s Snapz Pro X and several other professional screenshot utilities let you take a screenshot of any individual onscreen object, and last year I was enthusiastic about Layers, a screenshot utility that was—at the time—unique in its ability to save every onscreen element as a separate layer. But these utilities may be overkill for some people. Choose an element, and a screenshot of that item is saved to the Clipboard for pasting in your favorite graphics or page-layout program. Mac OS X’s own Preview works especially well for this: Just choose File > New From Clipboard (or press Command+N) and you get a new document that includes your screenshot. WindowClipMBI’s preferences include an option for ignoring shadows and other window-framing effects, as well as a setting to automatically add a white background to screenshots to ensure that the resulting images are completely opaque—the latter option is especially useful when taking screenshots of translucent elements such as Open and Save dialogs. WindowClipMBI is convenient, although it does have some limitations. For one, each menu-bar utility gets its own entry in the WindowClipMBI menu, which clutters the menu with items that, at least for me, seldom get captured. I wish there was a way to tell WindowClipMBI to ignore all menu-bar utilities and menu extras. (There is an option to exclude the windows and elements of particular programs, but this requires you to manually add each menu-bar utility to the list.) Also, the menu isn’t sorted alphabetically, which can make it a hassle to find the desired program. I hope to see improvements in these areas in future versions. Other limitations appear to be inherent in WindowClipMBI’s menu-based design. For example, because WindowClipMBI’s menu shows only items that are visible on the screen at the moment you activate the menu, WindowClipMBI can’t take screenshots of other interface elements that require user action—for example, menus in other programs. 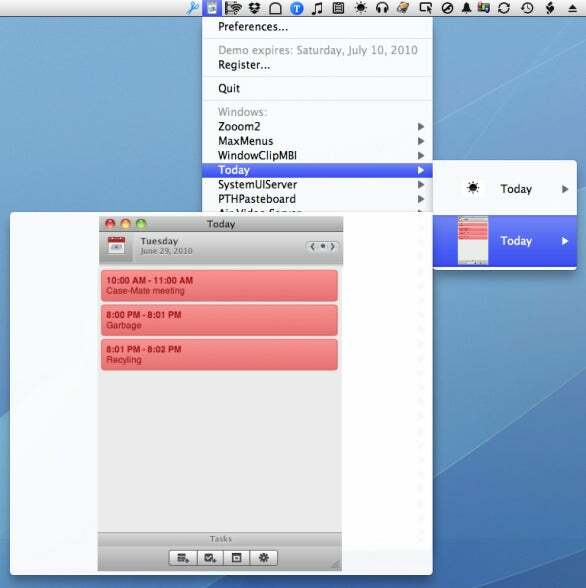 Also, some onscreen items, such as windows with drawers, are considered by Mac OS X to consist of multiple separate elements. WindowClipMBI thus displays each element separately, but unlike with Snapz Pro (which lets you Shift+click to capture multiple items), you can’t choose to capture those elements together. The workaround is to take the separate screenshots and them combine them in your graphics program. Note that the developer’s pricing is a bit complex. The program provides a time-limited demo for evaluating the software; if you decide to keep using WindowClipMBI, you pay a “donation” of your choosing: $10, $15, $20, or $25. But making that payment gets you not only a license for WindowClipMBI, but also for every one of Limit Point Software’s utilities—57 programs in all.